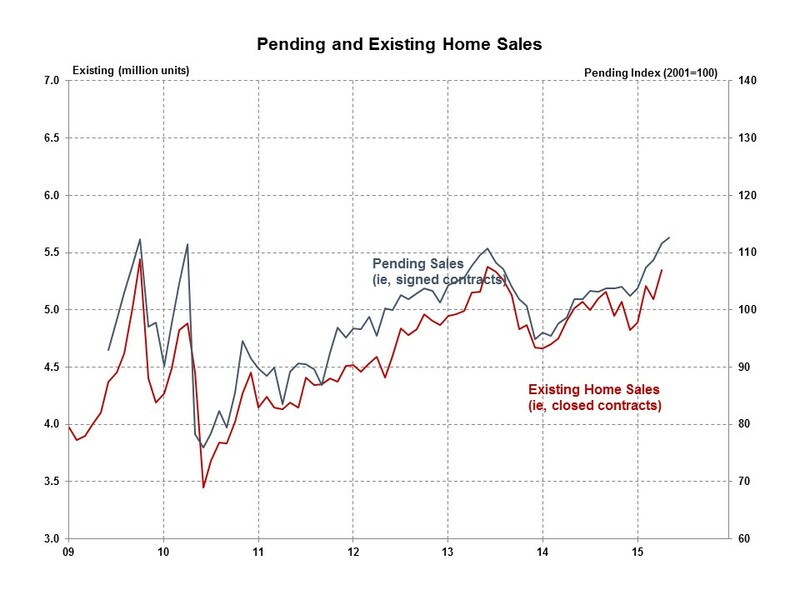 The Pending Home Sales Index increased for the fifth straight month to the highest level in over nine years. The Pending Home Sales Index (PHSI), a forward-looking indicator based on signed contracts reported by the National Association of Realtors (NAR), increased 0.9% in May to 112.6, and climbed to 10.4% above the May level a year ago. Regionally, the May PHSI increased 6.3% in the Northeast and 2.2% in the West. However, the May PHSI declined slightly by 0.6% in the Midwest and 0.8% in the South. Year-over-year, the PHSI was up 13.0% in the West, 10.6% both in the Northeast and South, and 7.8% in the Midwest. The string of positive pending sales releases in 2015 is consistent with the strong existing sales report from last week. This PHSI report suggests continued good news for the existing sales market and for builders in 2015.